As agreed by China and France, Member of the Political Bureau of the Central Committee of the Communist Party of China (CPC) and State Councilor Yang Jiechi will hold the 17th session of the consultation of the coordinators for the China-France Strategic Dialogue with Diplomatic Advisor to the French President Philippe Etienne in Beijingon December 19. The China-France Strategic Dialogue is directly responsible to the two heads of state as an important platform for strategic communication. This consultation is the first of its kind since the new administration of France was sworn in. We believe it will play a positive role in enhancing mutual political trust and strategic communication between China and France, implementing the consensus reached by the state leaders and planning and coordinating the high-level interaction and across-the-board pragmatic cooperation between the two sides going forward. 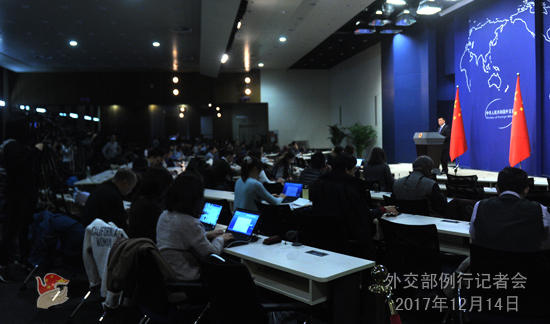 Q: We have noticed that on the first day of his state visit to China yesterday, ROK President Moon Jae-in mentioned the historical issue on several occasions, saying that as December 13 marks the 80th anniversary of the Nanjing Massacre, the ROK people empathize with the sufferings of the Chinese people. He offers condolences on behalf of his people and send sympathies to all those deeply grieved. He also said that throughout a long time, the ROK and China have shared weal and woe, and the two countries jointly fought against the imperialist aggression and the Japanese colonial rule. When China prospered, the ROK prospered too, and when China failed, the ROK too failed. The Northeast Asian region should open up the door of cooperation while facing up squarely to the history. In addition, reports say that President Moon Jae-in asked ROK Ambassador to China Noh Young-min to attend the state memorial ceremony of the National Memorial Day for Nanjing Massacre Victims in Nanjing though the Ambassador had planned to welcome the president at the airport. What's your comment on the above-mentioned remarks by President Moon Jae-in? A: We appreciate the friendship President Moon Jae-in showed to the Chinese people on behalf of the ROK government and people. China and the ROK are close neighbors. The two peoples have worked in unity and helped with each other in resisting the aggression of the Japanese colonialism and fighting for national liberation and made important contributions to the victory of the World Anti-Fascist War. All of you have seen that China held the grand state memorial ceremony of the National Memorial Day for Nanjing Massacre Victims yesterday to deeply mourn for the victims of the Nanjing Massacre and all the Chinese killed by Japanese aggressors, honor the memory of revolutionary martyrs and national heroes who laid down their lives for the victory of the War against Japanese Aggression and pay tribute to the international fighters and friends who sacrificed themselves in the fight against the Japanese aggressors together with the Chinese people. This ceremony demonstrates the Chinese people's firm position on bearing history in mind, honoring all those who laid down their lives, cherishing peace and opening up the future and solemnly declares the Chinese people's noble aspiration of pursing peaceful development. As Chairperson of the Chinese People's Political Consultative Conference (CPPCC) Yu Zhengsheng clearly pointed out in his address yesterday, only by getting a correct understanding of history can we open up a better future. Both China and the ROK are victims of World War II, and the people of both countries have maintained that only a correct understanding of history can prevent the repeat of tragedy. We appreciate President Moon Jae-in's instruction for Ambassador Noh Young-min to attend the state memorial ceremony of the National Memorial Day for Nanjing Massacre Victims. It not only shows the friendship to the Chinese people, but also testifies to the ROK's firm adherence to historical justice. China stands ready to work with the ROK to safeguard the truth of history, fulfill our common responsibility and mission and jointly uphold regional peace and stability. Q: According to what we learnt, China has summoned the Australian ambassador over Australian Prime Minister Malcolm Turnbull's comments about Chinese influence in Australian politics. Can you tell us more about what was said to the ambassador? A: The relevant official in charge from the Ministry of Foreign Affairs has had an important talk with the Australian ambassador to China. Australia should be very clear about China's position on the relevant issue of our bilateral relations. Q: Yesterday the memorial ceremony for the Nanjing Massacre victims sent out an important message of "opening up the future". Is the possible exchange of visits by the two state leaders part of ongoing conversations between China and Japan? How important is the improvement of China-Japan relations for the joint efforts to find a negotiated peaceful outcome for the Korean Peninsula crisis? A: As I said just now, CPPCC Chairperson Yu Zhengsheng clearly pointed out in his address yesterday that only by getting a correct understanding of history can we open up a better future. This year marks the 45th anniversary of the normalization of China-Japan diplomatic ties, and next year will witness the 40th anniversary of the signing of the China-Japan Treaty of Peace and Friendship. We hope that bearing in mind the fundamental interests of the two peoples and in the spirit of learning from historical lessons and moving towards the future, Japan will work with China to follow the four political documents and four-point principled consensus between the two sides to improve the bilateral relations in the right direction. In terms of the high-level interaction as you mentioned, we have maintained that high-level exchange is important to guiding bilateral relations. We hope Japan will work for the shared goal with China and create necessary conditions and atmosphere for high-level exchange between the two countries. With regard to the Korean Peninsula issue, we have reiterated China's position for many times. I am not going to restate that given that you must be very clear about it. I would like to say that we stand ready to maintain communication and coordination with Japan and other relevant parties to promote the peaceful settlement of the Korean Peninsula issue within the track of dialogue and negotiation. Q: US President Donald Trump signed into law the National Defense Authorization Act for Fiscal Year 2018, which considers the possibility of port visit to Taiwan by US military ships among other non-legally binding provisions. Do you have a comment on that law? A: Although those Taiwan-related clauses of this act are not legally binding, they severely violate the one China principle and the stipulations of the three China-US Joint Communiques and constitute an interference in China's internal affairs. 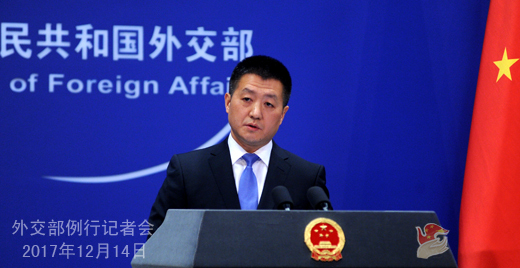 China always firmly opposes this and has lodged stern representations with the US government. We need to reiterate that the one China principle serves as the political foundation of China-US relations. China firmly opposes all forms of official exchange and military contact between the US and Taiwan as well as the US arms sales to Taiwan. 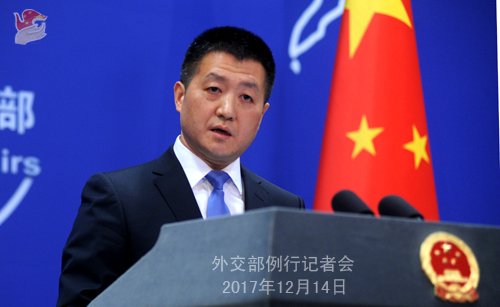 We urge the US to fully recognize the severity of the damage the Taiwan-related clauses may cause and properly handle the Taiwan-related issue in accordance with the one China principle and the stipulations of the three China-US Joint Communiques lest it should jeopardize the larger interests of China-US cooperation and cross-straits peace and stability. Q: On December 13, the extraordinary summit of the Organization of Islamic Cooperation (OIC) in Turkey adopted a statement which calls upon the international community to recognize East Jerusalem as the capital of the State of Palestine. What is China's comment on that statement? A: China understands the concern held by the Islamic countries over the status of Jerusalem. We support the settlement of this issue in accordance with relevant UN resolutions and international consensus. We also support the establishment of an independent State of Palestine that enjoys full sovereignty, with East Jerusalem as its capital and based on the 1967 border. We hope that the negotiation between Palestine and Israel could be resumed at an early date so as to reach a comprehensive, fair and enduring solution to the Palestinian issue. Q: Today, an ROK journalist was beaten by Chinese security guards when covering President Moon Jae-in's activities in China. The ROK side has expressed dissatisfaction. What is your comment? A: I also just learned of this news. If someone did get hurt, we are concerned about that. What I know at the current stage is that it occurred at a relevant event organized by the ROK side as part of President Moon Jae-in's visit in China. That being said, it still happened in China, so we are paying a lot of attention and are trying to gather more information from the ROK organizer. We hope it is just a small incident. We all know that China and the ROK are making meticulous preparation for President Moon Jae-in's visit. We believe we share the same goal here which is to ensure the success of this visit.